An artist's depiction of the battle and the death of Tecumseh. The Battle of the Thames, also known as the Battle of Moraviantown, was a decisive United States victory in the War of 1812 against Great Britain. It took place on October 5, 1813, near present-day Chatham, Ontario in Upper Canada. It resulted in the death of the Shawnee chief Tecumseh, and the destruction of the Native American coalition which he led. During the last months of 1812 and for much of 1813, the American Army of the Northwest under William Henry Harrison was attempting to recover Detroit and capture Fort Amherstburg at Amherstburg from the "Right Division" of the British Army in Upper Canada, which was commanded by Major General Henry Procter. The British position depended on maintaining command of Lake Erie. The sparsely populated region produced insufficient crops and cattle to feed Procter's troops, the sailors of the British ships on the Lake, and above all the large numbers of Native warriors and their families gathered at Amherstburg under Tecumseh; supplies could effectively be brought to them only by ships on the lake. Also, if naval command of Lake Erie passed to the Americans, they would be able to land an army on the north shore at any point of their choosing, cutting off Procter from reinforcement from the east. From the start of the war to the end of July 1813, the British ships, which since May 5, 1813 were led by Commander Robert Heriot Barclay, had maintained control of the lake. They contained the American squadron under Master Commandant Oliver Hazard Perry at Presque Isle harbour. When Barclay lifted the blockade for two days in order to receive supplies, Perry was able to move his ships across the sandbar at the entrance to the harbour and into the lake. Barclay declined to attack them. Once it was fully armed and manned, Perry's superior squadron instituted a counter-blockade of Amherstburg, and supplies of food there rapidly ran short. Finally, with supplies almost exhausted, Barclay put out to seek battle with Perry. On September 10, Perry gained a complete victory in the Battle of Lake Erie, after a hard-fought battle. On receiving Perry's hastily written note that "We have met the enemy and they are ours", Harrison knew that Procter would be forced to retreat, and ordered an advance. One thousand mounted troops began advancing along the lake shore to Detroit, and 2,500 foot soldiers were carried there and to Amherstburg by Perry's ships once the damage they had received in the battle had been repaired. Our fleet has gone out, we know they have fought; we have heard the great guns but know nothing of what has happened to our Father with one Arm [Barclay, who had lost an arm in 1809]. Our ships have gone one way, and we are much astonished to see our Father [Procter] tying up everything and preparing to run the other, without letting his red children know what his intentions are ... We must compare our Father's conduct to [that of] a fat animal that carries its tail upon its back; but when affrighted, it drops it between its legs and runs off. Nevertheless, Procter could not defend Fort Amherstburg. Not only was there no food, but the guns had been removed from the fort to be mounted on Barclay's ships. Procter began to retreat up the Thames River on September 27. Tecumseh had no option but to go with him. Procter apparently agreed to a compromise to retreat only as far as Moraviantown, a settlement of Lenape Indians who had migrated from the United States. As this was the highest point of the river to which batteaux could navigate, it was safe from outflanking moves by water. Also, some supplies could in theory be brought there overland from Burlington Heights, although the roads were very poor. However, Procter made no attempt to fortify this position. The British retreat was badly managed, and the soldiers had been reduced to half rations. Procter was alleged to have left the main body of his army under his second-in-command, Colonel Augustus Warburton of the 41st Regiment, without orders, while he led the retreat, accompanied by his wife and family, the other women and dependents, and his personal baggage. The British soldiers were becoming increasingly demoralized, and Tecumseh's warriors grew ever more impatient with Procter for his unwillingness to stop and fight, giving Procter reason to fear a mutiny by the warriors. The Americans left a brigade under Duncan McArthur to garrison Detroit and another under Lewis Cass to garrison Sandwich, Ontario. Harrison led the main body from Sandwich in pursuit of Procter on October 2. As they advanced, Harrison's men captured several abandoned boats and a steady stream of British stragglers. They caught up with the retreating British and Indians late on October 4. Tecumseh skirmished with the Americans near Chatham to slow the American advance, but the warriors were quickly overwhelmed. The batteaux carrying Warburton's reserve ammunition and the last of the food went aground and were left behind, to be captured by an American raiding party. William Henry Harrison's force numbered at least 3,500 infantry and cavalry. He had a small detachment of regulars from the 27th U.S. Infantry and five brigades of Kentucky militia led by Isaac Shelby, the 63-year-old governor of Kentucky and a hero of the American Revolutionary War. He also had 1,000 volunteer cavalry under Colonel Richard Mentor Johnson. Most were from Kentucky but some of them were from the River Raisin area, spurred on by the slogan "Remember the River Raisin." Procter had about 800 soldiers, mainly from the 41st Regiment. The veterans of the 1st Battalion of the regiment had been serving in Upper Canada since the start of the war, and had suffered heavy casualties in several engagements during 1813 (including the Battle of Lake Erie, in which more than 150 men of the regiment served aboard Barclay's ships.) They had been reinforced by the young soldiers of the 2nd Battalion. Most of the regiment's officers were dissatisfied with the leadership of Procter, but the next in command, Colonel Warburton, refused to countenance any move to deprive Procter of command. Tecumseh led about 500 Native warriors. Shortly after daybreak on October 5, after ordering his troops to abandon their half-cooked breakfast and retreat a further two miles, Procter formed the British regulars in line of battle with a single 6-pounder cannon. He planned to trap Harrison on the banks of the Thames, driving the Americans off the road with cannon fire. However, he had taken no steps towards fortifying the position (e.g. by creating abatis or throwing up earthworks), so the ground presented no obstacle to the American mounted troops, while scattered trees masked the British fire. Tecumseh's warriors took up positions in a black ash swamp on the British right to flank the Americans. Tecumseh rode along the British line, shaking hands with each officer, before joining his warriors. General Harrison surveyed the battlefield and ordered James Johnson (brother of Richard Mentor Johnson) to make a frontal attack against the British regulars with his mounted Kentucky riflemen. Despite the Indians' flanking fire, Johnson broke through, the British cannon having failed to fire. The exhausted, dispirited and half-starved British troops fired one ragged fusillade before giving way. Immediately Procter and about 250 of his men fled from the field. The rest surrendered. Tecumseh and his followers remained and carried on fighting. Richard Johnson charged into the Indian position at the head of about 20 horsemen to draw attention away from the main American force, but Tecumseh and his warriors answered with a volley of musket fire that stopped the cavalry charge. Fifteen of Johnson's men were killed or wounded, and Johnson was hit five times. Johnson's main force became bogged down in the swamp mud. Tecumseh is believed to have been killed in this fighting. The main force finally made its way through the swamp, and James Johnson's troops were freed from their attack on the British. With the American reinforcements converging and news of the death of Tecumseh spreading quickly, Indian resistance quickly dissolved. 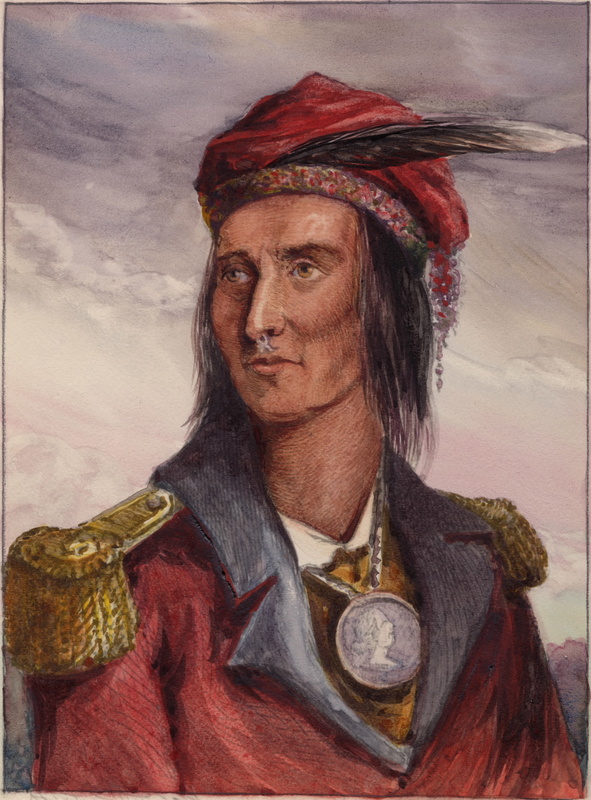 Colonel Johnson may have been the soldier who shot Tecumseh, though the evidence is unclear. William Whitley, a Revolutionary War veteran, is another credited with the killing of Tecumseh. Whitley, of Crab Orchard, Kentucky, volunteered for the raid on Tecumseh's camp, and was killed during the attack. Before his death, he requested that General Harrison have his scalp removed when his body was found and sent to his wife. After the battle, American mounted troops moved on and burned Moraviantown (marked today by the Fairfield Museum on Longwoods Road), a settlement of pacifist Christian Munsee of the Moravian Church, who did not participate in the fighting. Because the enlistments of the militia component of Harrison's army were about to expire, the Americans retired to Detroit. Three currently active regular battalions of the United States Army (1-6 Inf, 2-6 Inf and 4-6 Inf) perpetuate the lineage of the old 27th Infantry Regiment, elements of which were at the Battle of the Thames. Harrison reported that the British regulars had 12 killed and 22 wounded prisoners. Lieutenant Richard Bullock of the 41st Regiment, however, said that there were 12 killed and 36 wounded prisoners. The British Colonel Augustus Warburton and Lieutenant Colonel William Evans both reported, more than a year after the battle, that 18 were killed and 25 wounded. Harrison reported 601 British troops captured: a figure that included the prisoners taken during the retreat leading up to the battle and stragglers captured after it. The Native Americans recorded their own casualties as 16 killed, including Tecumseh and Roundhead, although Harrison claimed that 33 dead warriors were found in the woods after the battle. There are several versions of the American loss in the battle. Harrison stated 7 killed outright, 5 died of wounds and 17 wounded. Major Isaac Shelby said 7-8 killed outright, 4 died of wounds and about 20 wounded. Participants Robert McAfee and Peter Trisler, Jr., respectively gave 10 killed and 35 wounded and 14 killed and 20 wounded. Historian Samuel R. Brown stated 25 killed or fatally injured and 50 wounded in Johnson’s regiment and 2 killed and 6-7 wounded in the infantry, for a total of 27 killed and 56 or 57 wounded Harrison informed United States Secretary of War John Armstrong, Jr. that the only casualties inflicted on his command by the British troops at the battle were three men wounded: all of the rest were inflicted by the Indians. The American victory led to the re-establishment of American control over the Northwest frontier. Apart from skirmishes (such as the Battle of Longwoods) between raiding parties or other detachments, and an American mounted raid near the end of 1814 which resulted in the Battle of Malcolm's Mills, the Detroit front remained comparatively quiet for the rest of the war. The death of Tecumseh was a crushing blow to the Indian alliance he had created, and it effectively dissolved following the battle. Shortly after the battle, Harrison signed an armistice at Detroit with the chiefs or representatives of several tribes. He then transferred most of his regulars eastward to the Niagara River and went himself to Washington where he was acclaimed a hero. However, a comparatively petty dispute with President James Madison and John Armstrong resulted in him resigning his commission as Major General. Harrison's popularity grew, and he was eventually elected President of the United States. Richard Mentor Johnson eventually became to President Martin Van Buren, based partly on the belief that he had killed Tecumseh. Procter later rallied 246 men of the 41st Regiment at the Grand River. Reinforced by some young soldiers of the 2nd battalion who had not been present at the battle, the two battalions were reorganized and merged as the regiment was severely understrength at this point. The experienced survivors of the 1st Battalion were placed in the grenadier and light infantry companies. The soldiers of the 41st who were taken prisoner at Moraviantown and the Battle of Lake Erie were exchanged or released towards the end of 1814. They had been held in encampments near present-day Sandusky, Ohio, and had suffered severely from sickness during their captivity. In May 1814, Procter was charged with negligence and improper conduct, though a court martial could not be held until December, when campaigning had ceased for the winter and a suitably senior board of officers could be assembled. They judged that Procter had managed the retreat badly, failing to secure his stores, and also disposed the troops ineffectively at Moraviantown. He was sentenced to be suspended from rank and pay for six months. Wikimedia Commons has media related to Battle of the Thames. Antal, Sandy (1997). A Wampum Denied: Proctor's War of 1812. Carleton University Press. ISBN 0-87013-443-4. Carter-Edwards, Dennis. "The War of 1812 Along the Detroit Frontier: A Canadian Perspective," in The Michigan Historical Review, 13:2 (Fall 1987), pp. 25–50. Cleaves, Freeman. Old Tippecanoe: William Henry Harrison and His Time. New York: Scribner, 1939. ISBN 0-945707-01-0 (1990 reissue). Edmunds, R. David. "Forgotten Allies: The Loyal Shawnees and the War of 1812" in David Curtis Skaggs and Larry L. Nelson, eds., The Sixty Years' War for the Great Lakes, 1754-1814, pp. 337–51. East Lansing: Michigan State University Press, 2001. ISBN 0-87013-569-4. Elting, John R. Amateurs, To Arms! A Military History of the War of 1812. Chapel Hill, NC: Algonquin, 1991. ISBN 0-945575-08-4 (hardcover); ISBN 0-306-80653-3 (1995 Da Capo Press paperback). Gilpin, Alec R. (1958 (1968 reprint edition)). The War of 1812 in the Old Northwest. East Lansing, MI: The Michigan State University Press. Sugden, John. Tecumseh's Last Stand. Norman, Oklahoma: University of Oklahoma Press, 1985. ISBN 0-8061-1944-6.